Drinks menu with bottles icons of alcoholic beverages. Vector flat illustration. Eze, Evelyn M., Jacob, Ransom B. and Christian, Serekara G.
All correspondence to: Email: evelyn.eze@ust.edu.ng. A study of haematological profile of alcoholics residing in Port Harcourt Metropolis was conducted on 150 subjects, comprising of 100 heavy alcohol consumers and 50 non-alcoholics who served as control with age ranging between 20-50 years (mean 35years). Male constituted 94(63%) and females 56(37%) of the studied population. Standard venepuncture technique was used to collect blood sample from each subject into ethylene diamine tetra acetic acid ((K3EDTA) anticoagulant containers and analysed for haemoglobin concentration, white blood cells, packed cell volume (PCV), total and differential WBC count, platelet count, erythrocyte count, mean cell volume, mean cell haemoglobin, mean cell haemoglobin concentration, mean platelet volume(MPV), platelet distribution width(PDW) and plateletcrit(PCT) using automated methodology.The results obtained were analysed using statistical package for social science (SPSS 21.0). Mean and standard deviation (S.D) were done for all the haematological variables and subjected to test of significance. Student t-test was used to compare the result between the alcoholics and non- alcoholics. For validation of observations, values below p<0.05 were considered statistically significant. The results obtained shows that the alcoholics had significantly lower values (P < 0.05) for erythrocytes, platelets, mean platelet volume, PCV, leucocytes, and haemoglobin concentration and significantly lower values (P < 0.05) in MCV, MCH and MCHC in alcoholics compared to non-alcoholics. Heavy alcohol intake has serious effects on haematological parameters which could predispose the consumers to infection and bone marrow malfunction or even stroke. Hence, it is important to establish baseline indices for these parameters on the basis of level of alcohol intake and determine its deleterious effect on these indices. It is equally recommended to include red cell indices as one of the routine laboratory tests required in the management of alcoholic patients. Alcohol abuse constitutes one of the major socio-economic and health problems in the world today, the abuse cut across gender, race and ethnicity and the effect vary with age. It has become a public health concern among Nigerian youths and adults strata of the society. Alcohol as an organic compound is composed of a hydroxyl functional group bound to carbon atom (Nic et al., 2006, Oyedeji et al., 2013). Alcohol addiction and dependence have become increasingly serious health and social problems with many clinical studies indicating that adolescence is a key period for the development of this addiction (Crew et al., 2007) and it has been generally acknowledged that both genetic and environmental factors contribute to the propensity to drink alcohol (Pohorecky, 1991). consumption has been linked to more than sixtymedical conditions and is also linked to categories of disease whose relative impact on the global burden is predicted to increase (Das et al., 2006; Daset al., 2011). Indeed, there are variations in the biological response to alcohol consumption, which could be attributed to genetic differences. In low concentrations, alcohol reduces inhibitions and as blood alcoholic concentration increases in high concentration greater than 0.35grams/100 milliliters of blood (equivalent to 0.35grams/210 liters of breath) it affects the metabolism of many tissues and organs of the body. The organs most affected are the liver, bone marrow and the brain and the biochemical makers of alcohol abuse are mostly enzymes of the liver such as gamma glutamyltransferase (GGT), aspartate aminotransferase (AST) and alkaline phosphate (ALP) among which the GGT is the most sensitive (Adias et al., 2013; Das et al., 2011; Spoerke et al., 2010; Ejilemele and Orluwene, 2010). In Nigeria and other developing countries in the world so many alcohol – related accidents and mortality may have occurred without reliable documentation. Chronic alcoholism is the third leading cause of mortality even though many alcohols related death go unrecorded particularly in developing countries (Latvala, 2005) Chronic alcoholism has significant serious consequences on the haematopoietic systems involving the various blood cells, their progenitors in the bone marrow and clotting components (Erhabor et al., 2014; Arjun and Chaitali, 2015; Das et al., 2005; Costa et al., 2007). It is estimated that 3.5% of the global burden of disease is attributed to alcohol (Rehm et al., 2003). Nutritional deficiencies are not only necessitated by poor dietary habits of alcohol abusers but by the effect of alcohol on the absorption, storage and utilization of several vitamins. On the other hand, some findings from Ajani et al., (2012) revealed that wine may provide additional benefits over and above. Other researchers have been so intrigued by the possible benefits of low-dose alcohol that they have gone so far as to consider mechanisms by which alcohol can have salutary cardiovascular effects. Those mechanisms include: increased levels of high-density lipoprotein cholesterol and a decreased tendency to thrombosis. Coalescing these reported biological benefits with epidemiological findings, some medical organizations have stated that low levels of alcohol consumption may be considered safe or may be a legitimate item of discussion between physician and patient (Oduola et al., 2005). Alcohol abuse have tremendous impact on transport medium in cardiovascular system and the system of effect has been established but there is considerable evidence which have adverse effect on serum proteins, blood cells and their progenitors in the bone marrow (Laurent and Edwards, 2014; Nikajet al., 2014). The aim of this study was to thoroughly assess some haematological parameters among alcoholics residing in Port Harcourt, Rivers State, Nigeria as a way of generating scientific proofs for strategic interventions that can help curb or forestall deleterious effects of alcohol in Nigeria. This cross sectional study was carried out on a population of 150 adults comprising of 100 heavy alcohol consumers (subjects) and 50 non-alcohol consumers (non-alcoholics) that were apparently healthy and served as controls. Consumers of at least two bottles (120 centilitres) of alcoholic beverages (beer, red wine and local gins) daily for at least a period of four years were designated as alcoholics and strictly none alcoholics with neither current nor past history of alcohol drinking were designated as controls. The subjects were between the ages of 20-60 years for both test and control. The samples were sourced from different parts of Port Harcourt, Rivers State, Nigeria. Informed consent was obtained from all the subjects and none of them was clinically ill at the time of study while unwilling subjects were excluded. All the subjects were administered questionnaire to determine the amount of alcohol they consumed daily and the duration before their blood samples were collected. 3ml of fresh venous blood was collected from each subject using a standard venepuncture technique into ethylene diamine tetra acetic acid ((K3EDTA) anticoagulant containers and analysed for haemoglobin concentration, white blood cells, packed cell volume (PCV), total and differential WBC count, platelet count, red blood cells count, mean cell volume, mean cell haemoglobin, mean cell haemoglobin concentration, mean platelet volume (MPV), platelet distribution width (PDW) and plateletcrit(PCT). Each sample was mixed thoroughly with K3EDTA to prevent lyses and ensure anticoagulation. Samples were analyzed within 2 hours of collection. The Mindray automated blood cell analyzer performs haematology analyses according to the radio frequency and direct current (RF/DC) detection method was used. This method detects the size of the blood cells by changes in direct-current resistance, and the density of the blood cell interior by changes in radio-frequency resistance. A blood sample was aspirated and measured, diluted to the specified ratio, and sent to the applicable detector chamber. Inside the chamber is a tint hole called an “aperture,” on both sides of which are electrodes. Between the electrodes flow the direct current and radio-frequency current. Blood cells suspended in the diluted sample pass through the aperture, changing the direct-current resistance and radio-frequency resistance between the electrodes. The size of the blood cell is detected via changes in the direct-current resistance, and the density of the blood cell interior (size of the nucleus) is detected via changes in the radiofrequency resistance, with such detections coming in the form of electrical pulses. Based on the size of these pulses, a two dimensional distribution (scatter gram) of the blood-cell size and internal density can be drawn. Data were analysed using the SPSS 21.0 Windows statistical package and a student t-test was used to test for difference in haematological parameters between alcoholics and non-alcoholics. P<0.05 was considered as statistically significant. The results obtained from the study are presented in Table 1. Alcohol exerts a direct toxic effect on the bone marrow resulting in vascuolization of the bone marrow and thrombocytopenia (Erhabor et al., 2010). It also affects the function of leukocytes and platelets (Nikaj et al., 2014; Laurent and Edwards, 2014). Haematological functions are affected directly, and can also cause chronic liver disease and other metabolic derangement (Arjun and Chaitali, 2015, Das et al., 2005). Result from this study showed that alcohol has a wide spread effect directly or indirectly on haematological system which affect the leukocytes, erythrocytes and thrombocytes production which is also in consonant with the findings of Erhabor et al., (2010); Nikaj et al., (2014); Laurent and Edwards, (2014). Alcohol exerts a direct toxic effect on the bone marrow resulting in vascuolization of the bone marrow and thrombocytopenia. Haematological functions are affected directly, and can also cause chronic liver disease and other metabolic derangement (Arjun and Chaitali, 2015; Das et al., 2005). 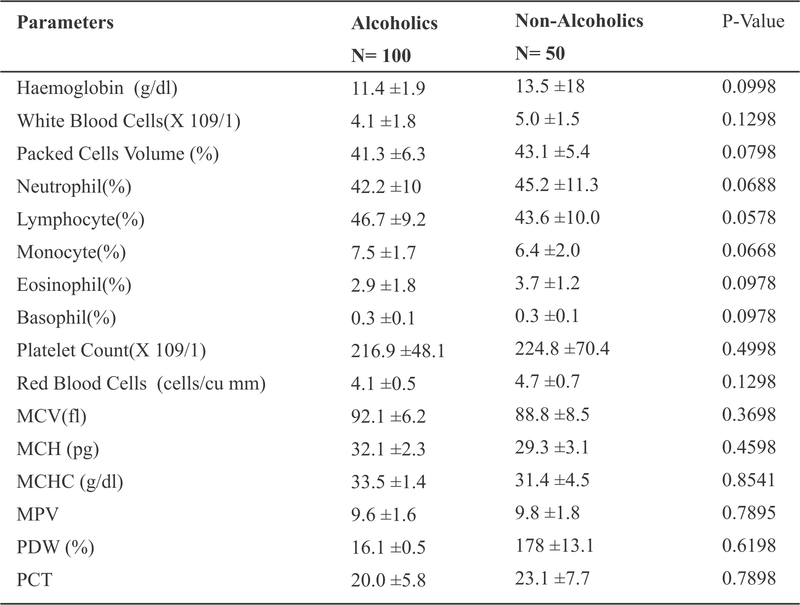 Values obtained for haematological parameters in alcohol drinkers showed a significantly difference in haemoglobin concentration and packed cell volume while platelet is reduced which could be attributed to ethanol which is the basic constituent of alcohol that has been reported to cause neutrophil and lymphocyte impairment with increased frequency and severity of infections in alcoholics. However, there are differences in the effect of alcohol from one individual to another. According to other research by Oduola et al., (2004) when the beverage is sipped, the peak of blood -alcohol concentration gets lower than when it is drunk, the activity of the enzyme in metabolism also aggravates as the percentage of alcohol to the blood is not constant after consumption but drops steadily when alcohol is ingested in combination with food. Nutritional differences are not only necessitated by poor dietary habits of alcohol abusers but by the effect of alcohol on the absorption, storage and utilization of several vitamins. This study has clearly shown that alcohol intake has serious effects on some haemotological parameters which could predispose the consumers to infection and bone marrow malfunction. Therefore, educating the society of the haematological health risk of the social behaviour is advocated. 1. Adias, TC., Egerton, E. & Erhabor, O. (2013). Evaluation of coagulation parameters and liver enzymes among alcohol drinkers in Port Harcourt, Nigeria. International Journal of General Medicine, 6,489-494. 3. Arjun, M.& Chaitali, M. (2015). Understanding the Pathophysiological Basis of Alterations of Haematological Picture in Alcohol Abuse Patients, Research & Reviews: Journal of Medical and Health Sciences, 4(4),1-5. 4. Costa, A.C., Ribeiro, B. & Costa, E. (2007). Platelet Indices in Chronic Alcoholic Liver Disease Patients with Thrombocytopenia, Archives of Gastroenterology, 44,201-204. 5. Crews, F., He, J. & Hodge, C. (2007). Adolescent Cortical Development: A Critical Period of Vulnerability for Addiction. Pharmacology and Biochemical Behaviours, 86,189-199. 6. Das, S.K. & Vasudevan, D.M. (2005). Biochemical Diagnosis of Alcoholism. Indian Journal Clinical Biochemistry, 20(1),35-42. 7. Das, S.K., Balakrishnan, V. & Vasudevan, D.M. (2006). Alcohol: Its Health and Social Impact in India. National Medical Journal of India, 19, 94-9. 8. Das, S.K., Mukherjee, S., Vasudevan, D.M.& Balakrishnan, V. (2011). Comparison of Haematological Parameters in Patients with Non-Alcoholic Fatty Liver Disease and Alcoholic Liver Disease. Singapore Medical Journal, 42(3),175-181. 9. Ejilemele, A.A. & Orluwene, C.G. (2010). Biochemical Changes in Chronic Alcoholics in Port Harcourt: The Report of a Pilot Survey. Nigerian Postgraduate Medical Journal. 17(2),154-159. 10. Erhabor, A.O., Yakubu, I. Z., Isaac, A. L., Sule, A., Wase, A. C., Ezimah, A., Mainasara, B. A., Isah, E. K., Uko, F. U., Adias, T.C., Iwueke, I. P., Ikhuenbor, D., Aghedo, F. & Igbineweka, O. O. (2014). Effect of Alcohol Consumption on Platelet, ProthrombinTime and Activated Partial Thromboplastin Time on Alcoholics in Birnin Kebbi, Kebbi State, Nigeria. International Journal of Tropical Disease & Health, 4(2), 224-232. 11. Latvala, J (2005). Effect of Alcohol Consumption and Acetyladehde on Blood Cells and Molecules: Pathogenic and Diagnostic Implications. Tampere: Tampere University Press. 12. Laurent, D. & Edwards, J.G. (2014). Alcoholic Cardiomyopathy: Multigenic Changes Underlie Cardiovascular Dysfunction. Journal of Cardiology and Clinical Research, 2(1),10-22. 13. Nic, M., Jirat, J. & Kosata (2006). 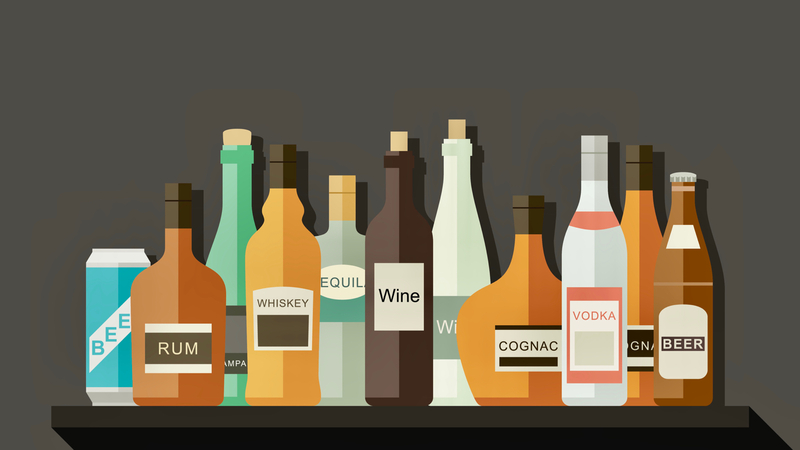 “Alcohols”, IUPAC Compendium of Chemical Terminology (Online ed.) ISBN 0-9678550-9-8. 14. Nikaj, A., Cakani, B., Shkoza, A., Ranxha, E. & Vyshka, G. (2014). Effects of Ethanol on the Heart and Blood Vessels. OA Alcohol, 2(1), 7. 15. Ochei, J.&Kolhatka, A. (2000). The Complete Blood Count. Medical Laboratory Science Theory and Practice. 7th edition. India: Tata McGraw-Hill Publishing Company. 16. Oduola, T., Adeosun, O.G, Oduola, T.A., Agbaje, N.R. & Raheem, Z.A. (2004). Drinking Patterns: Biochemical and Haematological findings in alcohol consumers in Ile-Ife, Nigeria. African Journal of Biotechnology, 4 (11), 1304-1308. 17. Oyedeji, K.O., Bolarinwa, A.F & Fashina, A.M. (2013). Effect of Alcohol Consumption on Haematological and Reproductive Parameters in Female Albino Rats. Journal of Dental and Medical Sciences, 3(5), 76-79. 18. Pohorecky, L.A. (1991). Stress and Alcohol Interaction: An Update of Human Research. Alcoholism: Clinical and Experimental Research ,15, 438-459. 19. Rehm, J., Gmel, G., Sempos, C.T & Trevisan, M. (2003). Alcohol-related Morbidity and Mortality. .Alcohol Research Health.27(1),39-51.